Patrick Henry, John Calhoun, and George Mason would be delighted that States are showing some backbone after 220 years of Federal power encroachment. States are again beginning to question Federal authority by, in effect, nullifying some Federal mandates. But the "nullification door" is swinging both ways. Is it not nullification of law by the Federal Government itself when they who hold the federal reins refuse to enforce the laws currently on the books? And when no enforcement of the law is at the whim of an administration, what recourse exists for the citizenry? For the States? Both ends of the political spectrum have engaged in nullification, the rejection of Federal law. As noted in this piece by David Leib, the current focal points of dissonance between State and Federal revolve around a strange mix of topics; healthcare, guns, illegal immigration, citizen identification, and marijuana. We can clearly identify both ends of the sociopolitical spectrum and note they have become strange bedfellows in disobeying the federal government. Coloradans thumb their nose at federal marijuana laws while Montanans do the same with federal gun laws. Federal authorities have repeatedly delayed implementation of the 2005 Real ID Act… about half the state legislatures have opposed its implementation, according to the National Conference of State Legislatures. After Montana passed a 2009 law declaring that federal firearms regulations don’t apply to guns made and kept in that state, eight other states have enacted similar laws…"
But the nullification door swings both ways. As States issue an affront to select federal law, the federal authorities elected and appointed seem also to have some issues themselves with federal law. Even though they have pledged via their oaths of office to enforce these laws, when it serves their political purposes we often get nonenforcement. Despite vowing diligence there is a steady record that is in effect "legislation via non action" by federal agencies and apparently done so at the direction of the Executive and Judicial branches. In some instances the federal authorities reject any local, police, or State assistance in enforcing federal law as in the Arizona illegal immigration situation. In many marijuana cases, the federal government seems uninterested that State law conflicts with the law on the federal books. Illinois and Chicago in particular drag out a federal mandate to comply with the Second Amendment. Yet most assuredly those same federal authorities will expect local enforcement of new gun laws in Montana. When polling place violations go unprosecuted, when sanctuary cities invite illegal immigrants and guarantee no pursuit, when immigration agents are told to ease up, and when the War Powers Act that requires the president to consult with Congress but the president only delivers mere notification… are these not de facto nullifications of law? When States detect that they are being harmed by new federal law, it is more justifiable for them to act than those oath obligated federal office holders channeling their political wishes by choosing which laws to enforce and which to ignore. "The powers not delegated to the United States by the Constitution, nor prohibited by it to the States, are reserved to the States respectively, or to the people"
"The powers delegated by the proposed Constitution to the federal government are few and defined. Those which are to remain in the State governments are numerous and indefinite.". Article I, sect 8 of the Constitution clearly delineates that which the Federal Government "can" do, and section 10 of the same Article clearly states what the States "can’t" do. State governments preceded the "federal experiment" and it was from these 13 States the powers so delegated to the "federal experiment" originated. But now add in the Supremacy Clause noting State law can not be in conflict with Federal Law, and if such occurrence arise, Federal law will be "supreme’. More complications arise when the powers of Article I, sect 8 are deemed unbound by how activists interpret the "necessary and proper" clause. All of this sets before us a cauldron of countervailing double- entendre laden documents that often seem internal contradictory. Is it a ‘mish mash’ or a brilliant work of governance? The Federal Papers lend guidance to the Constitution. These papers fill in the gaps and clarify instances in which the English language within the Constitution sometimes falls short. In Federalist #32 and #33, Hamilton, a devout federalist, points to a certain sovereignty status retained by the States. As the plan of the convention aims only at a partial union or consolidation, the State governments would clearly retain all the rights of sovereignty which they before had, and which were not, by that act, exclusively delegated to the United States. Today’s resurgence of nullification of federal law by the States is perhaps the greatest since 1861. John C. Calhoun led a nullification movement in South Carolina in 1832 regarding the collection of federal tariffs on imports. Prior to that, there were the instances of opposition to a National Bank, New England’s opposition to the War of 1812 voiced in the Hartford Convention and also New England’s opposition to the Mexican War and their sending of troops to that effort. Thomas Jefferson himself led nullification efforts in 1798 with the Kentucky Resolution in which "the states had the right and the duty to declare unconstitutional any acts of Congress that were not authorized by the Constitution". Madison followed with the Virginia Resolution in the same spirit. Interposition: This involves the identification of the grievances by the offended party (State), adopted by the legislator of that State, and noting the unconstitutional nature of the proposed act by the Federal Government or by other States as being injurious to the offended State. A demand for "appropriate redress" is included. 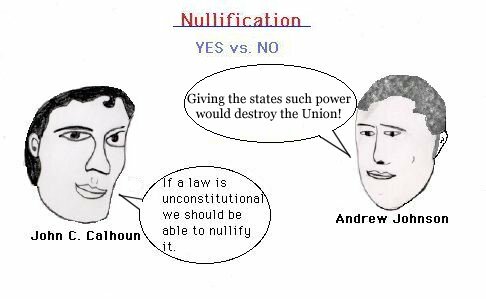 State Declaration of Nullification: The State will call for assemblies and authorities within the State to then empower such bodies to then craft an ordinance of nullification. Ordinance of Secession: If the ordinance of nullification should fail to restore proper balance between the Federal Government and the State, by act of sovereign power and ordinance of secession will be adopted. Secession is unlikely today, but the concept was unresolved in 1861. State sovereignty was a more justifiable position. Virginia, Rhode Island, and New York all ratified the Constitution with the proviso that if they became harmed by the "federal experiment", they retained the powers to withdraw. To extrapolate, and because these ratifications were unconditionally accepted at the convention in which all States were equal partners, these rights to ‘withdraw’ radiated to all the States ratifying at that time. State resistance to harmful federal legislation is an important component to our federal system. Nullification must be promoted cautiously but once committed, States must hold firm even if it draws an extortion such as the withholding of Federal highway funds. Turnabout is fair play, and as an administration selectively ignores passed law, States gain traction in challenging new Federal law. Principle must trump financial consideration and the promise that is our form of government must not be whittled away.